Following Comb Ridge, I joined back up with the WINs outside of Bluff, UT. Bluff was one of the settlements made by the Morman's who came west through the Hole in the Rock. Not many people live in Bluff today, in fact, there isn't even a grocery store, but there is a lot of history and of course, Puebloan ruins. Just south of town is the Sand Island Petroglyphs. They are supposed to be about 800 years old, but I think some were carved much later. Notice the cowboy on a horse in the lower left corner? I don't think the Ancient Puebloans had horses 800 years ago. 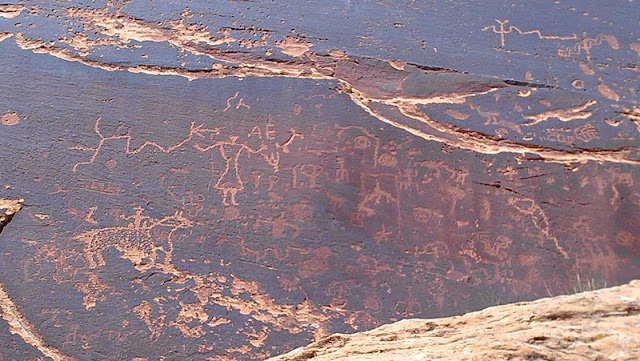 But many of the petroglyphs are easily identified as Anasazi. Much of the area is open grazing and sheep is the primary livestock of the area. Even the grocery stores sell mutton and lamb chops. These sheep are oblivious of my car. Some of the herds have security dogs and they will bark at the cars, making sure they stay away from the sheep. Many of the restaurants serve mutton dishes. I had the daily special of mutton stew one day and it wasn't too bad. Wouldn't want it to be my main diet, but it was ok.
Diana led us on a hike to the Butler Wash Petroglyphs. It had been 5 years since she had been here and I think it had grown over quite a bit. She called our foray through the Tamasik, Olive trees and Cottonwoods, as bushwacking and I wholeheartedly agree. It caused my allergies to go nuts for the next few days. 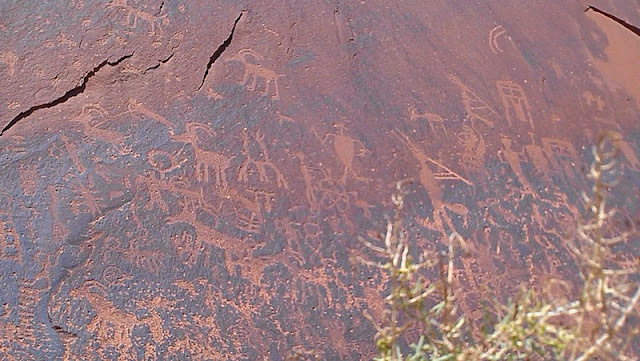 But after about a mile of bushwacking, we found the petroglyphs. And of course, there were ruins along the way. Fort Bluff is a recreation of the original settlement. But this wagon is one of the actual wagons which was brought through the Hole In the Rock to arrive at this location. When the Mormon pioneers came to the Colorado River, they found they would have to traverse over 1000 foot down steep cliffs, to cross the river. In six weeks time, winter was coming, they blasted, carved and chiseled a way down. Taking one wagon at a time, they lowered each wagon slowly down the cliffs, on the roadway they made in the rock. Despite the hardships, not one person perished in this trip and two babies were born on the way. A recreation of the cabins the settlers built. Just a one room cabin, entire families lived here. What would our children of today think if they didn't have their own bedrooms? Lots of horses also wandered the open range. Deep in this crevase is the 17-Room Ruin. Once easily accessible by crossing a footbridge on the San Juan River, then hiking about 1/2 mile to the ruins, the footbridge was destroyed several years ago in a flood. Now, you have to drive about 20 miles to cross the river and arrive at the ruins. But Pat and I found the ruins and hiked up to see them close up. The only way into the ruins was using the hollowed out foot and hand holds in the rock. Once at the ruins we could look down on our RVs across the river. Just a mile away, and yet it was over 20 miles to get here because of the river crossing. Part of the old bridge which washed away in the flood. I also kayaked the San Juan River while I was here. Just a short 8 mile kayak from where we were parked, down to Sand Island. Most of the river was quiet and there were some very shallow areas. Of course, the one spot which had a little fast water, and a curve, I paddled right into the tree trying to stay off the sand bar and made the worst mistake you can make kayaking. I grabbed onto the tree. Yep, I did it, and yes, I tipped over. Boy, the water was cold. But I wasn't hurt, and was able to swim with my kayak over to the shallow area and dump out the water so I could be on my way. We left early to hike to House on Fire Ruins. They say if you get there early, when the sun comes over the ridge and hits the ruins, the site is spectacular. The coloring in the rock make it look like there are flames shooting out of the ruins. More handprints on the cliff walls. Max and I hiked another 2 miles or so down the canyon and found more ruins. The wash was dry the day we hiked, but you could see the flattened grass showing where the flash flood from a few days earlier had raged. The grass would have been standing tall, like above, if not for the flooding. Max climbed up to these ruins, but I stayed down below. It worked out because I could take this picture. While at the House on Fire Ruins, we met some people who told us about the Ballroom Cave and Ruins. So the next day we all head out to find these ruins. It's a good thing we also looked up the info before hand since the people gave us the wrong directions. The Ballroom Cave and Ruins are in the area of Butler Wash, north of Hwy 95. Here is where they ground their corn. That is an old, dried up, mummified corn cob in the lower left. There were 2 caves. They are not connected today, but there have been some rock falls. Maybe they were once connected. Looking out of one side to the other, you can see ruins at the mouth of the lower cave. There were walls and ruins built inside the cave as well as outside. And of course, more handprints. You might not be able to make it out, but there is a pictograph of a person (red paint), to the left of the hands. I was impressed because these ruins have not been stabilized or reconstructed, yet the roof of this ruin was still partially in tact. Climbing down was a bit tricky. I'm sure Bertie was glad she had her pole. Comb Ridge is about 15 miles west of Blanding, and there is BLM land where camping is available. It is a great location for visiting Natural Bridges National Monument and the many Puebloan Ruins in the area. This was a dry wash when we arrived, but after several days of rain it was a raging torrent. It really did meet the criteria of "too thick to drink, but too thin to plow". This was at the camping area when we arrived. Someone said there had been a pickup seen there, but for the week we were there we saw no one. I guess they didn't want to deal with a wet sleeping bag and shoes. On the rainy day, Max and I headed over to Halls Crossing on Lake Powell. It was a long drive, about 75 miles one way, but it was dry and hot at the lake, not rainy. There are ruins everywhere in the area. These were off the side of the road on the way to Halls Crossing. The next day several of us headed over to Natural Bridges National Monument. There are 3 natural bridges in the park and numerous ruins. Most of the ruins are not noted on their literature and unless you have heard about them elsewhere or asked the ranger specifically, you won't know how to find them. Sipapu Bridge, one of the largest natural bridges in the world. There are paths to hike down to the bottom of each of the bridges, but due to time, we chose to only hike down to the 2nd bridge, not this one. Horseshoe Ruins can be seen from the rim. It is located between the 1st and 2nd bridges in the park. Kachina Bridge, is one the youngest bridge in the park. We hiked down the 600 feet drop in 3/4 of a mile to the bottom. There was water in the wash, so we had to be careful or we would get our feet wet. We wanted to hike down here because of the petroglphys and pictographs and ruins. Both along the bridge walls, as well as the cliffs nearby where the ruins were located, there were lots of pictographs and petroglyphs (old time graffitti is what I call it). These hand prints were all over the walls in the Kachina Bridge Ruins. The Kachina Bridge Ruins were older than many we have seen. Instead of just using rocks and mud as a morter, they plaster the mud over the rocks in these ruins. There were several butterfly pictographs. The info on these ruins speculate it might have been a symbol of this clan. Looking through the bridge from the bottom. You have to look close to see this bridge. It just blends into the background. This is Owachoma Bridge, the oldest in the park. The bridge is only 9 feet thick. Hovenweep is a National Monument highlighting six sites of the ancient Puebloans. I was able to visit 5 of the 6 sites. Usually sites on top of the mesa have deteriorated much worse than the cliff dwellings. Some of these sites have been partially reconstructed, but mainly they are in their original state with only some stabilization. This is the back view of the castle. Back in the 1930s when they first stabilized this ruin, they used concrete. You can see where they stabilized the wall because the concrete is a different color. Today when they stabilize a ruin they use materials and techniques that are similar to those used 700 years ago. Looking across the canyon, you can better see the massive structure of the Hovenweep Castle. Standing in front of Tower Point Ruins. Down in the canyon is Eroded Boulder House. The ruins are built inside with double walls. There are supposed to be some pictographs inside, but you are not allowed to climb through this ruin without a guide. Not actually part of Hovenweep National Monument, this is Painted Hand Pueblo. We stopped here because it is near one of the Hovenweep sites. Painted Hand Pueblo is part of the Canyon of the Ancients National Monument. As you can see, this was a multi-story pueblo. It is hard to see, but there is a painted hand on the back wall. We found remains of walls all over the cliffs and canyons. Max and Fancy are playing King of the Mountain (or rock actually). Cutthroat Ruins had ruins on top of the mesa, as well as underneath the cliffs below. Part of the Holly Group Ruins. Notice the rock has split and part of the ruins looks as if it is about to slide off the rock. More of the Holly Group, this square tower was built right on top of this rock. Formidable, this tower is over three stories high and not easily accessible. Even though the roof of this building is gone, there are still some of the supporting log braces which are over 700 years old. This is the Petroglyph View at the Holly Group Ruins. Part of the Horseshoe Ruins. Horseshoe and Hackberry Ruins were so close together, I'm not sure which was which. These ruins were located at the end of a canyon, on top of the mesa. It's amazing to remember these ruins are all over 700 years old, some as much as 800 years old and they are still standing. I can't help but wonder how many of our buildings today will still be around in 800 years.